Piano and keyboard variations inspired by the new wave of synth-driven pop predominant in the '80s. While stemming from the post-punk era of the late ‘70s but eventually becoming more and more synonymous with the budding synth-pop scene of the early ’80s, the catch-all use of the term "new wave" has been subject to debate and stylistic confusion. However, monumental success of acts like Alphaville, Eurythmics, Depeche Mode, Duran Duran and a host of others in many ways claimed the genre, making their synth-driven pop the predominant soundtrack in the ’80s and well into the '90s. Inspired by the greats of the era, this collection of EZkeys MIDI picks up on the edge, the attitude and the over-the-top approach to songwriting and melody often attributed to the genre. 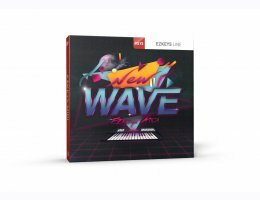 This is the perfect collection of EZkeys MIDI for anyone looking to write '80s-inspired pop songs that have a different melodic flair. Ideal for use with EZkeys String Machine, EZkeys Mellotoon, EZkeys Electric Grand – or any timeless acoustic piano, for that matter. Start experimenting!